When a writer unashamedly reveals his own imperfections, tragicomic and true stories result. The writer Tamminen is in continuous agony, particularly when it comes to being a man, unlike his uncles and the other men in his village, who have a king-like capacity for being men without griping about it. When, on the football field, Tamminen gets a perfect pass and is perfectly set for a goal, he panics and kicks the ball in the wrong direction. Although even the best players – models of manliness each of them – also miss goals, the missed shot weighs on Tamminen’s mind for days afterward. As if a world out of balance with all its demands weren’t enough, Tamminen is also looking for a place to hide – from literature, writing, and reading. Its a relief when he can simply read and write the way other people do. I’m not good enough as a father, as a son, as a volleyball player, or home-improver, cook or judge of literature. 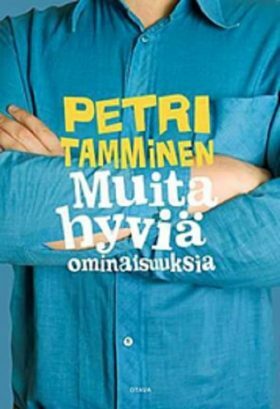 In the process of describing his timidity and shame, Petri Tamminen sets himself up as a model character, and lives through such horrors as writing on the typewriter used by his idol, Veijo Meri.